Without a doubt, my favourite meal of the day is breakfast. 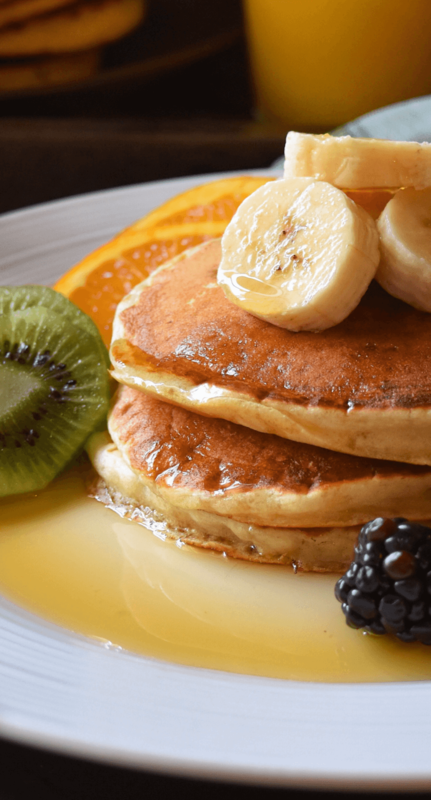 If it was up to me, I would have breakfast foods for lunch and supper as well… especially if these Buttermilk Pancakes are being served. 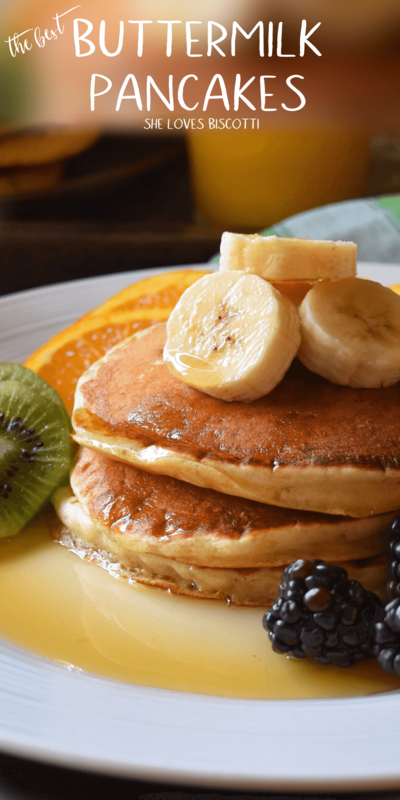 These fluffy Buttermilk Pancakes are everything you would expect from restaurant-style pancakes -and you won’t believe how easy they are to make. Once you combine your wet and dry ingredients in two separate bowls, it’s just a matter of adding the wet ingredients to the dry and mixing until just combined. No mixer. No hand held beater. Just a whisk, a mixing spoon and two bowls… that’s it. 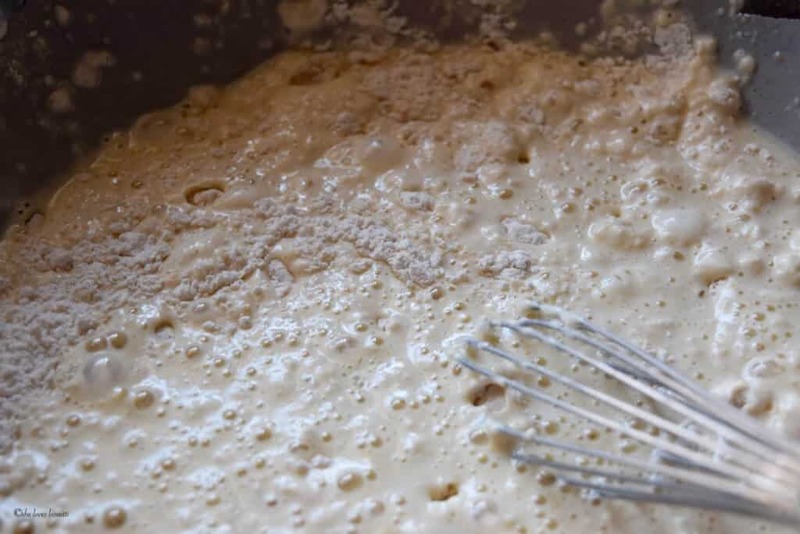 Once your batter is combined, drop a large serving spoon of batter in a large non-stick pan. When you begin to see the air bubbles surfacing, it is time to flip. This usually takes about 2-3 minutes on medium heat. Once you have flipped your pancake, continue to cook for 1-2 minutes until golden brown. This is a simple, basic recipe that works great with a variety of toppings. Simple or all dressed up with blueberries, raspberries, bananas, butter, maple syrup, jam or even this Cocoa Hazelnut Butter. The choice is yours to make. Have you ever topped your pancakes with Traditional Quebec Maple Syrup Poached Eggs? Along with this recipe for Maple Baked Beans, you have what it takes to have your very own sugar shacking party! This recipe can easily be doubled for a large crowd and leftovers can be frozen, which can be convenient in the mornings when you are running late. I used to subscribe to a Canadian magazine called Homemakers for the longest time until it closed (the 2011 Holiday issue was the last publication). That is where I got this recipe. I’ve made very little changes to this Buttermilk Pancake recipe. I substituted the granulated sugar with brown sugar; and replaced the butter with vegetable oil. 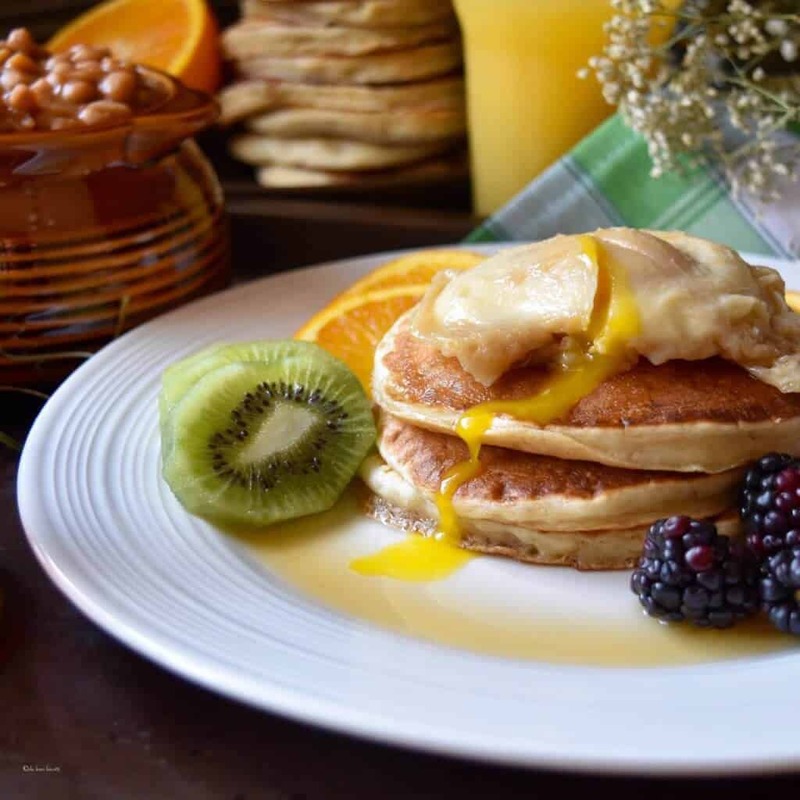 Whether you are having these Buttermilk Pancakes for breakfast, lunch or even supper, I hope you will enjoy them as much as I do! These fluffy Buttermilk Pancakes are everything you would expect from restaurant-style pancakes -and you won't believe how easy they are to make at home. In another bowl, whisk together buttermilk, egg,oil and vanilla. Mix well. Add the wet mixture all at once to the dry ingredients. Stir together just until combined. It's okay if batter is still a little lumpy. Place a large non-stick pan over a medium/high heat. Pour about 1/4 - 1/3 cup of batter for each pancake (I use a large serving spoon). Cook 2-3 minutes until bubbles start to form on tops. Flip and continue to cook for 1-2 minutes until golden brown. Place on a rimmed baking sheet and transfer to oven to keep warm (set oven to 250℉/120℃). Breakfast is also my favorite meal of the day, especially if I have these buttermilk pancakes. They look so fluffy… thanks for sharing. Breakfast for dinner is always a good idea!! 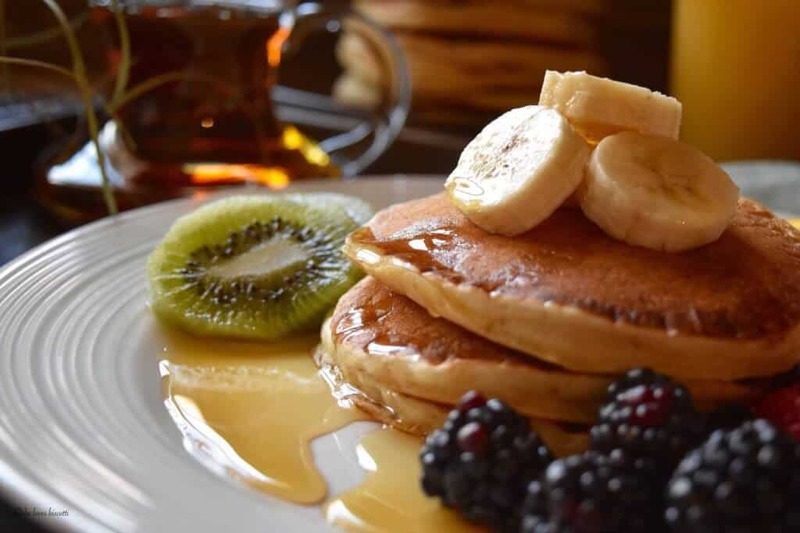 😉 Look at the perfect bubbles on these pancakes – they look so light and fluffy! Making these for Eva & Cristian – as per Anna’s recommandation to try your recipe! Hi Maria, made these for Sunday lunch…..Sarah and Adamo really loved them. They turned out just as perfect as your picture. Only problem is…everyone wanted MORE.